Home » Uncategorized » The World’s Oceans In Disarray–What Is Wrong With This Picture? The World’s Oceans In Disarray–What Is Wrong With This Picture? Take a good, hard look at the image below. 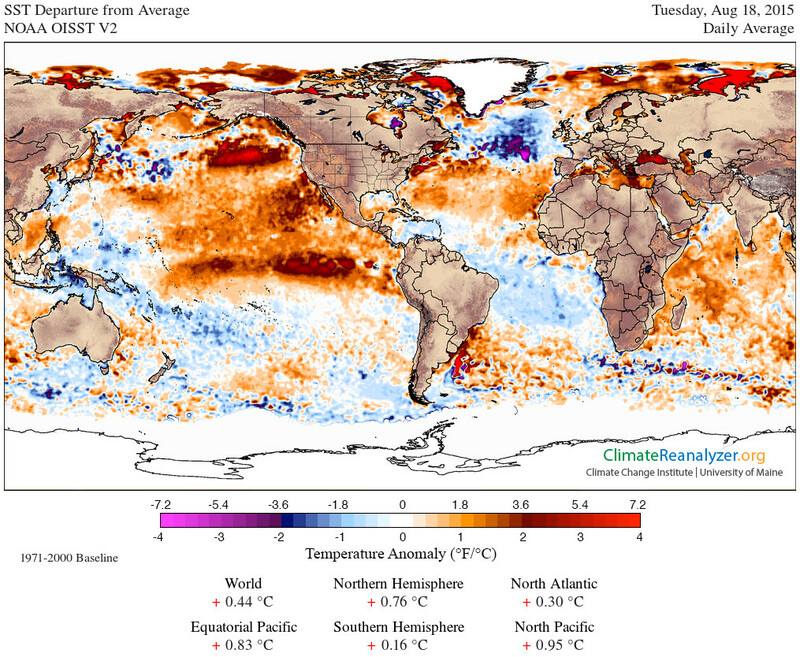 It is a representation of sea-surface temperature anomalies the world over (“sea” in this case including large lakes). I count eight serious things that are wrong with this picture, and I’ll take a few minutes to describe what they are and how they are impacting human society and playing a bit part in driving the fulfillment of prophecy. But first, as I said, take a good, hard look at the image below. The image above is from the Climate Reanalyzer program at the University of Maine. It is a visual representation of current data. The image reflects the surface water temperature anomalies for today, and these measurments are from both satellite and buoy arrays (including the ARGO buoy swarm, etc.). Here are the eight alarming things that I see wrong with this picture. “The Blob”. When scientists name things, they usually give names that are obscure and difficult for the general public to understand. This is not the case with the guy who names the pool of unusually warm water off the coast of British Columbia and Gulf of Alaska. He named it “The Blob”, and it is having a global impact. Looking at the image above, you will see the brown/copper “blob” sitting west of BC, Canada and south of the Gulf of Mexico. By any measure, the pool of unusually warm water is huge. It is also really, really warm (relatively speaking) in that it is some 3-7F warmer than the water there normally is. That may not seem like much, but the energy represented in that pool is staggering. I don’t know how many hundreds of thousands of nuclear bombs worth of energy are represented, but you get the idea: there is a vast amount of energy trapped in that warm water. The water from The Blob exists because of the Rediculously Resilient Ridge (RRR) — a ridge of high pressure that has been in place for two years now (which is unheard of) and has kept clouds and storms away from the area, letting sun warm the water. The energy in the water is now affecting atmospheric flows and is strengthening the RRR. It is the RRR that has shunted storms away from California and the US west coast. These same storms are shunted to northern BC and Alaska, and even into the Arctic circle and the North Pole. The Blob is changing global circulation patterns and is keeping tropical moisture away from the US west and is delivering it instead to the arctic, where it is hastening the melt of the arctic ice pack. Just below The Blob you will see an dark brown area of anomalously warm water that is set in an ocean of slightly less anomalously warm water. This water, off the coast of California and Mexico, doesn’t have a glamorous name like its brother to the north. And yet it, too is changing global circulation in the atmosphere. The warmer waters are also spurring massive die-offs of some life-forms in the Pacific, while at the same time creating the conditions for the largest blooms of toxic red algae ever seen by man. The seas are seemingly turning to blood in some parts of the Pacific. This area of warm water also helps reinforce the RRR and keep the US west in drought. El Nino. The eastern Pacific is one big warm pool, and at the southern portion of the eastern Pacific is El Nino. This elongated area of warm water (which started near Papua New Guinea and flowed east to the northwest Central American coast) is historically large. It is huge and, if it gets bigger, will set an all-time record for observed El Nino’s. This El Nino is also changing atmospheric circulation patterns. For one thing, it is setting up a stronger monsoonal flow over New Mexico, Texas, and the American Southeast. Some of the heat from El Nino, along with heat from a ridiculously hot Sea Of Cortez and Gulf of Mexico, is influencing the monsoonal flow and making temperatures in the US south and southeast almost unendurable. El Nino is also bringing drought to South America (which was already in drought) and to the Caribbean and much of Asia. When rains do come to these places, it is a pounding rain that damages and kills. This El Nino is a very destructive one. But here is the thing: even though this is a monstrous El Nino, it is not powerful enough to overcome The Blob and its little brother. The heat in the eastern Pacific is steering El Nino moisture away from the US west coast, meaning that the epic drought in California will probably endure for another year. That hot “bridge” between eastern US and northern Africa. Take a look at the Atlantic and a couple features will jump out at you. One of them is the “bridge” of unusually warm water stretching from the east coast of the US to the northwestern coast of Africa. Just to be clear: that’s not normal What is happening here is that the Atlantic Meridional Overturning Circulation (AMOC) current has slowed significantly and is being shunted toward northwest Africa and Portugal/Spain. What is AMOC? Well, it is part of the global ocean current system that moves and refreshes water at every level and in every ocean. Basically, warm briny water (it has more salt because of evaporation) moves out of the tropical region and, in the AMOC, moves north along the east coast of the US, crossing over the Atlantic and warming England and the Nordic states. Here the water cools and, because it has more salt, it sinks to the bottom of the ocean and then joins a current that takes it to far parts of the world. If it wasn’t for AMOC, England and the Nordic states would be much colder (and so would Iceland). But, as I say, the current has been shunted over toward Northwest Africa and Portugal/Spain, heating those areas and bringing more humidity and storms. Exactly what is shunting this massive current out of its course? That is item #5. That warm spot off of southern Brazil. It is interesting that Sao Paulo is in dire drought (just short of all-out crisis and early evacuations) at the same time this warm spot appears. But, as with The Blob, it would be a mistake to infer cause and effect. Or at least, it would be a mistake to infer that the warm spot causes the drought. This is because the warm spot may be linked to a lingering high pressure ridge as with the RRR or it may be because the atmospheric circulation out of the Amazon has changed, causing knock-on effects that result in less clouding, etc. Take it any way you want, that is a very large area of very warm water. The Indian Ocean. Recently there were heat dome incidents in India and Pakistan and in each case, it was a national medical emergency that sent hundreds of thousands to hospitals and sick beds, while thousands died. The heat domes resulted in a combination of heat and humidity that the human body simply could not withstand. In both incidents, the heat build up in the Indian ocean was complicit, providing as it did greater flows of heat and humidity into both countries. There are other areas of significant heat build up, including the Sea of Cortez and the Gulf of Mexico, both of which affect the US. There is also the Mediterranean and the Baltic. Recently the Mediterranean was complicit in a heat dome in Egypt, which spurred another health crisis there. These heat domes combining with hot and humid onshore flows are unprecedented and bear watching. A super-heated arctic. The problem with a square map representing a round world is that the polar regions have to be really stretched and distorted in order to fit. But take a close look at the copper-colored seas of the Arctic and you can see just how (relatively) warm they are becoming. This is especially true of the seas around western Greenland, where anomalous heat is really chewing at ancient glaciers (which then melt and flow out and join the cold spot in the north Atlantic). Arctic ice continues to shrink year-on-year and the result of disappearing ice is that the exposed water soaks up the heat of the sun (which the ice previously reflected) and the ice that reforms over the warm water is thinner and weaker, melting more readily the following year. The reduced ice pack, in turn, has less effect on the atmosphere and the polar vortex slows and shifts toward Greenland, bringing waves of super-cold air over Canada and the central and eastern US. Taken altogether what we are seeing is stunning. Tropical heat and humidity being shunted to the arctic? Unprecedented in recorded history. Hot water resulting in die-offs and massive areas of blood-red seas? Unprecedented. A high-pressure ridge warming an ocean so vigorously that it can sweep aside a record-breaking El Nino? Unprecedented. Frequent and super-charged heat domes with atmospheric connections to overheated seas? Unprecedented. Our oceanic system is in disarray on a global basis and it is affecting life all over the planet, with killing droughts, killing heat, and killing storms. I’m kinda raising my eyebrows at #4, as that is the typical path followed by Atlantic hurricanes. Since warm water has more energy, won’t that tend to fuel hurricanes to be much stronger? George, Most hurricanes tend to track further north, then become post-tropical storms, then peter out into nothing. Take a look at this global map that shows past hurricane paths (and their strength): http://earthobservatory.nasa.gov/IOTD/view.php?id=7079 So, if hurricanes continue to track into the cool spot they will pretty much die a quick death. But, for the few that hit Portugal and Spain, they will spin into more powerful monsters. The hot spot/cool spot dipole can spin up cold-core cyclones (such as we saw about two weeks ago) that can pound England, and that is the biggest worry.